Bvlgari goes right on making flankers to their original Omnia fragrance (2003), and I go right on trying them, even though we're now at flanker #5 and I haven't really liked one since flanker #1 (Omnia Crystalline, 2005). But I'd guess that #2 and #4 (Omnia Amethyste, 2007 and Omnia Coral, 2012) outsell the earlier ones, and Omnia itself is likely no longer in production.1 The latest is Omnia Indian Garnet, and like all the rest of the series, it was developed by perfumer Alberto Morillas. And no, I don't like it either, so feel free to skip the rest and go on about your business. I will say that Omnia Indian Garnet is a bit nicer than I expected, and like Omnia Coral, it does have more heft and personality than the earlier flankers, which didn't stray far from fresh, clean and light. The opening is bright citrus and vague fruit with a very mild saffron; it warms quickly but never really works up to the exotic sort of thing you might imagine from the notes (mandarin, orange, saffron, osmanthus, tuberose and amber) or the name (the 'Indian' part would not appear to reference anything but the gemstone). The floral heart is likewise warm, and it's reasonably deep, but still, blander than you'd expect — maybe there's osmanthus and tuberose, who knows, but I wouldn't have recognized either. It just smells like department store perfume flowers. The dry down is a woody musk, again, warm-ish, with a hint of soft spice, but it's neither warm nor spicy enough to move Omnia Indian Garnet into the oriental family. Verdict: Meh. It's pleasant enough, and I didn't mind wearing it at all, but still, meh. If you're after a warm orange-y thing for spring / summer, Omnia Indian Garnet is certainly worth a try, but it just isn't as lively as it ought to be, and you could surely do better if you set your mind (and your nose) to it. It smells like Alberto Morillas wasn't given much of a budget to work with, and like he was told to keep it tame: what Omnia Indian Garnet could really use is a dose of the masala spices from Omnia. Do comment if you can think of a lovely warm orange-y thing for spring / summer! And of course, if you've tried Omnia Indian Garnet and you loved it, do speak up. 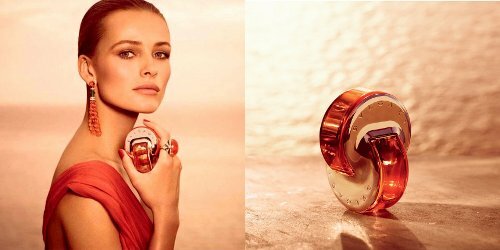 Bvlgari Omnia Indian Garnet is available in 25 ($48), 40 ($65) and 65 ($82)ml Eau de Toilette. There is also a matching soap, $30. 1. As I mentioned when I reviewed Omnia Coral, the original Omnia was not included in Bvlgari's "Charm collection" when the travel sprays were first introduced in 2011, and Omnia has not appeared on the Bvlgari website at all for a couple of years at least. Omnia Green Jade (2008) is no longer there either, although it was originally in the Charm collection. At the moment, you can still find both fragrances online, but they're not as widely available as they once were. The original Omnia is great — I have a full bottle and a miniature for travel — but none of the flankers has been worth a damn, and it doesn’t sound like this one will be, either. “Department store perfume flowers” is a great description of the middle section of at least 90% of what’s being launched these days. It’s really a shame they didn’t do at least one flanker that was a play on the original, and this one would have been perfect — an orange Omnia. My Omnia is gone. I will miss it. I did not think to see if they’re still making Black, but Bvlgari is not what it used to be. Well it seems you liked it more than I did because I thought it was meh-unpleasant rather than meh-pleasant, lol! Then again, while it was sprayed on the back of my hand I had some other scents sprayed on my fingers, so it’s hard to be really sure. In any case, you have backed up my original judgment – that this one is not worth re-trying! It got a meh, blah and won’t come back to sniff more from me. 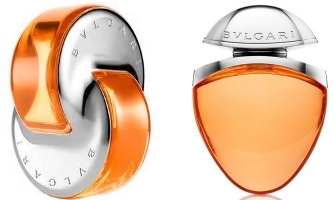 Bvlgari has changed…too bad. I think I would like that orange jewel though…again, too bad. I do think Coral is ok..and usually is a compliment getter as well. Not something I would wear often but every once in a while is nice. What about Hermes Mandarine Ambree? I need to test it again actually, it may have been too sweet and/or basic for me..perhaps a good layering scent though. An orange scent I sniffed recently that I found good for summer would be Mandarine Basilic. The little charm bottles are adorable. I do wish they’d done one in Omnia before they discontinued it, I would have bought one. I’ve thought about buying Crystalline, but I don’t really love it all that much. Robin, I think Orange Blossom from Jo Malone is a pretty orange fragrance for Summer. I may be a bit bias because everyone knows I am a huge Jo Malone fan, but I absolutely love it. Beautiful scent for Spring / Summer. Probably gonna be flogged for this suggestion–or accused of giving perfumistas a bad name while knocking people over with my fragrance–but I recently bought a not-brand-new-but-not-truly-vintage bottle of Tabu, and I found it to be quite a lovely spicy, warm, touch-of-oranges scent for a cooler spring day. As for the Omnia flankers, my expectations are so low at this point, I’d have to need to be killing time at the mall for quite a while before I’d mosey over to try the latest releases. At least two of them were functionally scentless to my nose, which came as quite a surprise since I’m a fan of the original! That’s funny because it’s the original, I think, that most people are anosmic to…and maybe somewhat Crystalline as well! People used to complain they only lasted 5 minutes. Tabu! I promise not to flog you, just apply with some restraint. Although it couldn’t possibly be as strong as it used to be. The original one I only got thirty minutes ( give or take 10) before my nose went ” What fragrance ? I got nothin .” And that was with some SERIOUS SPRAYAGE! Like 35 sprays . I was asphyxiating my coworkers , customers, passers by…..so I passed it on to my Mom who wears it nicely ( rather than a scent bomb of mass destruction…)and I get to smell occasional whiffs in her wake. Win win. I tried the Indian Garnet one yesterday and liked it. I noticed the men’s side has the Aqva Amara out too . I wonder if one was a submission for the others brief that the company buyer said no but I like it let’s make it a flanker for the opposite genders line! Yes, the Omnia flankers made me appreciate the meaning of being anosmic to something. I think I’d heard that before about Omnia flankers. I wonder what it is or is not? Many people got nearly instant olfactory fatigue from Omnia, & to a lesser extent crystalline….so they could smell it for a few minutes, then it was gone. I can’t smell Omnia very well either. Pour Femme was a great scent. I suppose the Omnia bottles may not be all that practical but my eye is always drawn to them when I see them in the shops. The visual Indian Garnet images you’ve included above are also quite beautiful too. What a pity. I still remember the first time I had an Omnia mini and wasted 30 minutes trying to figure out how to spray it! Yes, they did a nice job on the images, they always do. Wish they’d be a little riskier in the fragrance development. Yep, quite the enigma, those minis are. I thought am I just stupid or what the heck? I was a huge fan of their very first fragrance, the green tea one. Before if was more widely available I was visiting London so popped into their Sloane Street store (you have to be buzzed in, first time I’d experienced that!) to have a sniff. Got chatting to a lovely member of staff, who was immediately aware of the fact I wasn’t there to purchase jewellery, so was sniffing/spraying away when he asked me to wait a moment, then came back with the most beautifully packaged sample for me, a small box with a hollowed-out centre where the bottle fit, surrounded by lovely illustrations of the ingredients c/w a booklet explaining the fragrance. I was thrilled & still have the box & booklet somewhere! What a great story! Some SAs do realize that an experience like that can gain the brand a very loyal customer. Yikes! Do not utter the d word and Bvlgari Black in the same sentence. One of my desert island fragrances and I have a back up bottle of Omnia since we knew this day would come! Love them both! Sorry. It’s still shown in the men’s section on the website, so safe for now. PdN Maharanih was an excellent perfume with an orange note. Now there is Maharanih Intense, which I have not tried. well, I am a dummy. I bought it. Complete waste of my money! But I had to have it! Sephora only had 2 bottles of it and not on display yet but they sprayed me with a sample . The I asked if I could buy one…of sure! Love the colored bottle. Love the fact that I was the only one that had bought a bottle of it in this store. Got so excited about my purchase..I own it! No one else does yet! LOL, The laugh is on me. Nice fragrance but nothing worth writing home about…..just another drugstore fragrance. If only they had put in some sort of fine India spice to distinguish this from all the other same smells. Don’t bother. It’ll be in tjMaxx on discount within a year. So sorry! Sephora does take returns…I’d take it back. Thank you, NST. I did not know that.